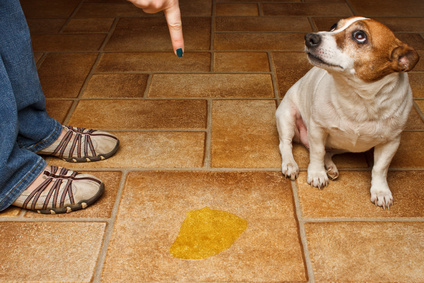 Your pet wakes up in the morning with a puddle of urine beside her. She may be dribbling urine when she walks. 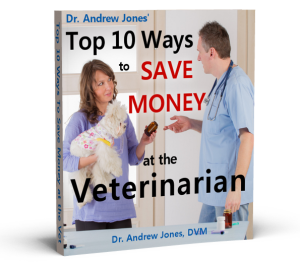 The most common occurrence is in middle-aged spayed female dogs. They have lost a source of estrogen that is needed to maintain bladder control. Older dogs and cats are also prone to liver and kidney failure, which may show up as bladder incontinence. NIGHT WATER RESTRICTIONS. Only put down a small amount of water at night, but always allow free access to water for the rest of the day. SUPPLEMENTS. Some glandular supplements can help your spayed female dog produce more natural estrogen. These are generally known as raw gland concentrates. One product available at health food stores is called ‘Female Caps’ (Solaray). The dose is 1/4 capsule per 10 lbs of body weight daily. This can be tried for 30 days to see if it will be effective. PLANT ESTROGEN. Soy isoflavones are a great source of estrogen. These can be purchased as an extract under the brand name Genista. The dose is 1/4 capsule per 10 lbs of body weight daily. Use for 30 days to see if they are effective. Flax is another good source of Plant Estrogens – the dose is 1 teaspoon per cup of food daily. NERVY. Back injuries sometimes put pressure on the nerves that control the bladder. Hold your thumb and index finger and locate the dip between the vertebrae on either side of your pet’s backbone. Press straight down for two seconds then release. Start at the middle of the spine and go to the tail. This helps move the spine, keeping it flexible and may release any excess pressure on the nerves. There are acupressure points that control the bladder as well as influencing the adrenal glands. BL1, located on the inside of the eye; BL13, BL14, BL15, located along the spine at the level of the front shoulder; BL67, located on the outside of the lateral toe on the rear foot; SP6, located on the inside of the back leg above the hock; SP10, located just above the knee. Put pressure on each of the points for 1 minute twice daily for 2 weeks. If this appears to be helping regain control, repeat the pressure once per week. Herbal therapy is aimed at replacing these with plant Estrogens: Oat Straw and Yams will help. One herbal formula includes: OAT STRAW, PLANTAIN, NETTLE AND HORSETAIL. Dose is 15 drops per 20 lbs of the tincture. 2 Tablespoons over her food, she weighs 79 lbs. Thanks for your suggestions. My dog Sammie has had bladder control issues since she was spayed. Didn’t recognize the connection until now. Very informative article. OAT STRAW, PLANTAIN, NETTLE AND HORSETAIL, please?